For much of its 100-year history, Douglas was dominated by two smelters—the Copper Queen and the Calumet and Arizona. 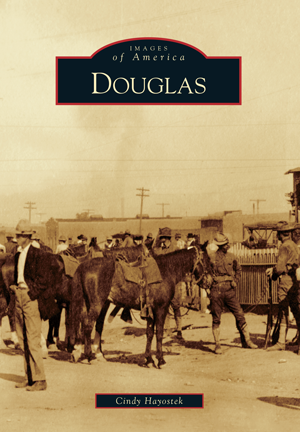 But Douglas thrived on the Mexican-American border because it was always more than just a smelter town. It was a section headquarters for the El Paso and Southwestern Railroad, host to three distinct army camps, and a hub for area ranchers and farmers. Douglas residents were crazy about aviation and built an airport where many aerial firsts took place. Although it may seem that the often-deadly intrigue surrounding the Mexican Revolution and the two battles fought in Agua Prieta, the Sonoran town across the international boundary from Douglas, would limit trade and tourism possibilities, the opposite was true. After the last smelter closed in 1987, Douglas relied heavily upon border trade of all sorts for its growing economy. Today Douglas and Agua Prieta capitalize on the vibrancy from the meeting of two cultures. A lifelong resident, Cindy Hayostek enthusiastically shares the history of her hometown through photographs from the Cochise County Historical Society, Douglas Historical Society, and private collections. Hayostek, a longtime journalist, now publishes a quarterly magazine about Douglas history, Borderland Chronicles.